Ghost Upon the Floor: Marley was dead. The season of the ghost is now upon us. Again? I've written about this before, of the uncanny connection between the Christmas holiday and the day which is the reason for this blog existing. The progression is a natural, if not often thought of one; All Hallow's Eve is celebrated on the verge of the major change, the summer's abundance ending, with the fear and knowledge that the end is coming, the nights growing longer, on the ever chilling wind. Halloween leads into the season where our weather is (in climates which allow) the coldest, the most severe, the darkest. And this is where Christmas happens. Christmas itself is a study in contrast. What is generally celebrated as the feast of light, good-will and peace among women and men happens in the dead of winter, when the earth and world are barren and frozen. Families travel to be together during the times of the year which can bring the harshest weather for traveling, and there is a mad rush to give-- to others, our family and friends. I think Charles Dickens lighted onto this concept of what Christmas was, and penned "A Christmas Carol." 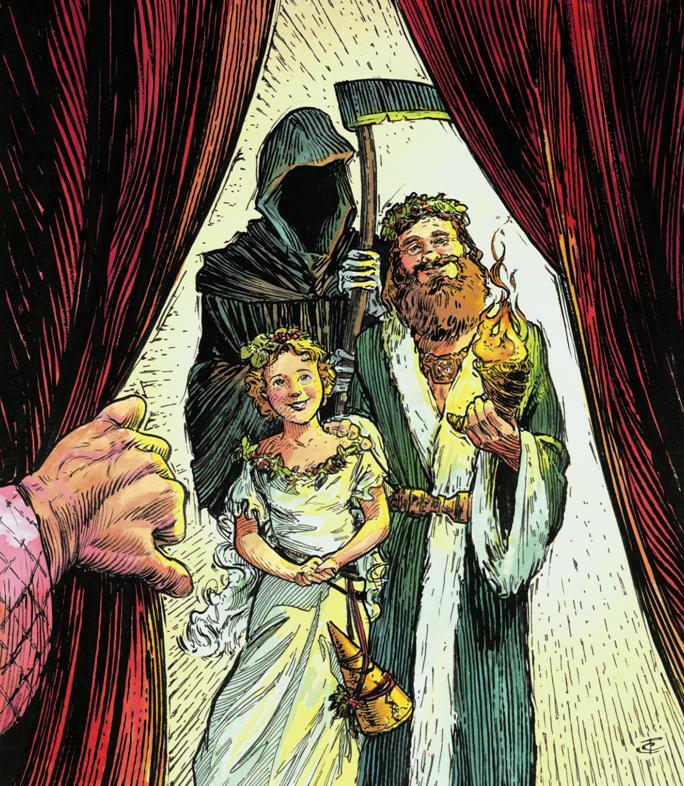 For the modern world, it's hard to imagine a Christmas season without "A Christmas Carol"-- whether in the original novella form, or the numerous film and television adaptations the classic has seen. What would appear the definitive story about the celebration of Christmas is, frankly, a story where a miserable man is literally haunted by Christmas personified as actual, from-the-grave ghosts. In other words, "A Christmas Carol" is about a man, Ebenezer Scrooge, who is so miserable and cold to the world he lives in Christmas sees no choice but to terrify him, and shake him out of his wicked ways. While Scrooge is alive, his soul is dead. And while his ex-business partner Marley is dead, he returns to Scrooge with a message more alive than the both of them. It would appear Mr. Scrooge needed a little Halloween to show him what Christmas is all about, Charlie Brown. What works so perfectly about the tale is that Christmas is so full of ghosts-- the ghosts of our past, our childhood, those and that which have come before. The year-ending season is a time to stop. And think. About the Christmases of the past- who was with us, what we might have done, and what we may have wished we had done. 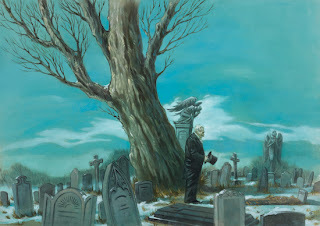 While Marley serves as a frightening specter to Scrooge because, in life, Scrooge knew him, and now must witness the ghostly fright that is his existence after death-- the Ghost of Christmas Past haunts Scrooge (and us) because of the many forms the ghost takes. Often depicted as a candle, or with either a candle or candle-stopper, the ghost always haunts, fragile and fleeting, because she was here-- and will always remember. Never be able to be changed. 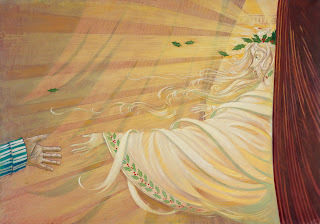 Her successor, the Ghost of Christmas Present, was and has continued to be a manifestation of the modern Christmas spirit-- a very much St. Nicholas/Santa Claus type of spirit-- bearded, joyful and abundant in laughter, good will (and size.) But at the same time, the ghost is deeply reflective, offering biting critiques on society, in addition to his jovial nature. This ghost's haunting is different-- haunting to Scrooge and us all by making us aware of our surroundings-- the joy of the season, the suffering of the less fortunate in the world, like the Crachitt family. 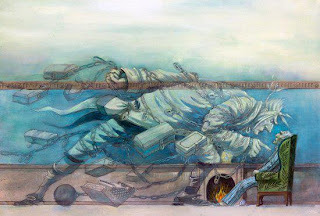 And lastly, the Ghost of Christmas Yet to Come haunts us when we think of the ghosts of the past, the ghosts of the present-- and what they mean if they remain unchanged. 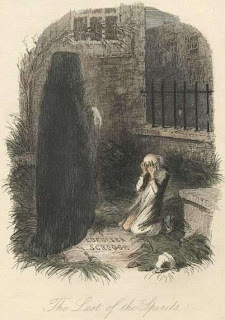 This ghost, nearly always depicted as a Grim Reaper or similarly hooded figure (and, in an original twist in the recent Disney animated adaptation, as simply a shadow never seen) scares-- or, rather, makes him aware-- Scrooge into the knowledge of the nature of his ways, by literally bringing him to the grave. Where all the memories of Christmases past and present will end, without opportunity to change them for the better. And so. While Christmas has become not only a Christian holiday, but developed a secular following and celebration around the season of giving gifts-- I wish you a Merry Christmas. And all the comes with it. Happy haunting, if your need be.